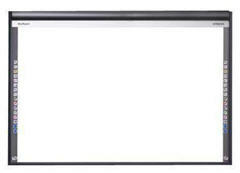 The Hitachi FXDUO-88W Starboard FXDuo is an 88" digital whiteboard designed to deliver the most seamless interactive experience in the industry. Gone are the days of pen-driven or stylus and finger controlled technology with an obtrusive overlaying surface. 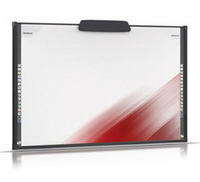 The FXDUO-88W looks and feels like a classic whiteboard! By using two sophisticated CMOS sensors located in the top corners, the StarBoard can sense where users are touching. The result is a more comfortable and interactive experience with less parts to lose or break. 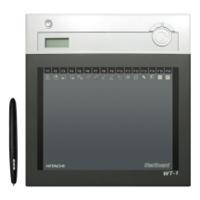 Features such as multi-touch manipulation, overhead quick start buttons, and the ability to have multiple users at once, open the unit up to virtually limitless possibilities. The surface of the whiteboard feels natural because it is natural. If the board gets scratched or damaged, the system will continue to work without fault. Possibly the most useful feature of the FXDUO-88W is that it doesn't need a special stylus or pen to function. This can be critical in classrooms, where small objects tend to break or disappear. The StarBoard works much like other devices with a multi-touch type design. Zoom in and out, scroll, enlarge, and shrink objects just by using two hands. Teachers can keep classroom activities fun and exciting by getting students involved. The FXDUO-88W even allows multiple users to manipulate the board at once, opening up endless creative learning possibilities. Since all the electronics of the StarBoard rests in the top of the unit, there's no need to send the entire board in to be serviced in the event of a problem. Simply send in the sensor housing, saving both time and shipping costs. .